MFN Meeting: February 13, 2016 at 10:00 a.m. The February meeting of the Macomb Feminist Network will be held Saturday, Feb. 13 from 10-11:30 a.m. As usual, we will be meeting in the Community Room of Macomb’s City Hall from 10:00 to 11:30 a.m., when Margaret Ovitt will discuss the background and current status of the Macomb Food Co-op. Come and learn more about this important venture. MFN Meeting: November 14, 2015 at 10:00 a.m. Please mark your calendars and plan to attend the November 14 MFN meeting. As usual, we will be meeting in the Community Room of Macomb’s City Hall from 10:00 to 11:30 a.m., when Cynthia Stiffler of Samaritan Well and Tracy DeWitt of Genesis Gardens will speak with us about Homelessness in the Macomb Area. 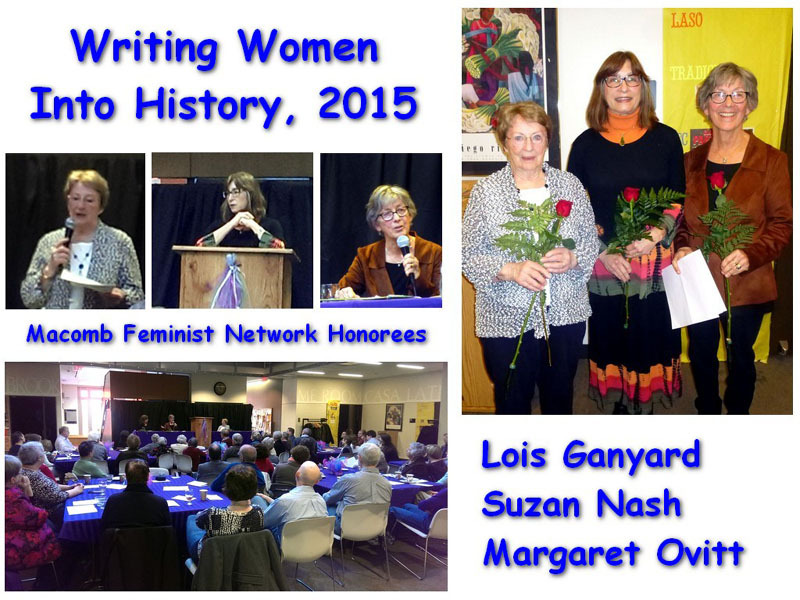 The Macomb Feminist Network is soliciting nominations for the annual Writing Women into History Award. Established in 2010 to honor, promote, and expand our knowledge of the extraordinary contributions women have made to our local community through their initiatives, advocacy and/or engagement. Women eligible to be nominated have resided in McDonough County; have been exceptional role models; and through their initiatives, advocacy and/or engagement, have made extraordinary contributions within the local community. Community members may submit a nomination by completing the nomination form below and attaching a supporting letter. Self-nominations, when accompanied by a supporting letter, will be considered. Nominations of women who fit the criteria but who are no longer living will also be considered. The MFN Awards Committee members will review all nominations and select the recipient(s). Nominations will be kept for one year, so previous nominations do not have to be resubmitted but additional support may be submitted. The recipients’ stories will be shared at the annual awards brunch to be held Saturday, March 5, 2016 from 10:00-11:30 AM at Western Illinois University’s Multicultural Center in conjunction with National Women’s History Month. The form and letter should be sent to MFN, P.O. Box 765, Macomb, IL 61455 or emailed to Sally Egler at davidsally75@gmail.com. Nominations are due by November 30, 2015. MFN Meeting: September 12, 2015 at 10:00 a.m. Please mark your calendars and plan to attend the September 12 MFN meeting. As usual, we will be meeting in the Community Room of Macomb’s City Hall from 10:00 to 11:30 a.m., when Janna Deitz and Terri Vanmeenen-Misfeldt will discuss the June Ready to Run workshop. Janna will discuss the workshop that she organized and other Ready to Run initiatives. Terri “attended as a mentor for [her] former graduate assistant who expressed interest in possible policy internships.” The nonpartisan workshop, which was exceptionally well organized, brought together women who were serving or had served in the Illinois and Iowa state legislatures as well as other government bodies. We will also be electing Board members at this meeting, something we do each year. If you want to become more involved with MFN programming, please consider becoming a Board member. Typically, the Board meets once a year, usually in June. Other business is taken care of via email or at regular member meetings. MFN’s annual Summer Social is Tuesday, July 28 from 4-6 p.m. in the Macomb City Hall Community Room. Members are asked to bring an hors d’oeuvre to share. MFN will provide wine and juice. We’ll have time for a quick review of the activities of the past year and a preview of potential programs for the new year–which begins Saturday, September 12, in the Community Room of Macomb’s City Hall. Most of our time next week will be given to socializing, i.e. mingling, mixing, hanging out, hanging around with, interacting, conversing, hobnobbing. MFN Meeting: April 11, 2015 at 10:00 a.m. Please mark your calendars and plan to attend the April 11 MFN meeting. As usual, we will be meeting in the Community Room of Macomb’s City Hall from 10:00 to 11:30 a.m., with Gayle Carper speaking the first hour and a business meeting following. Gayle Carper, WIU Faculty Emerita and attorney, will be discussing the Grand Jury system as it exists in the US today. To be considered: how Grand Juries are created, their purpose, composition, jurisdiction, procedures, and potential impact on the cases they explore. We are probably all aware of the use of Grand Juries in the Michael Brown and Eric Garner cases and your curiosity may have been peaked because of the outcomes of both. Gayle will be able to clarify how, when and why Grand Juries are used and answer our questions about them.